Custom programs are presented on a variety of topics including public participation, zoning, subdivisions and specific topics such as cell tower siting regulations and farmland preservation. Other Agencies: DNR, DOT, etc. Appendix: Cell Towers, CAFOs, Moratoria . . . The program is intended to be user-friendly, convenient, and easy to complete. 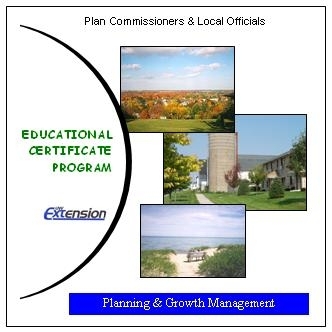 In October 1999 the Wisconsin legislature acted in response to increased development issues and planning needs when they adopted a comprehensive planning law to help communities plan their growth while maintaining the quality of life their residents currently enjoy. At its best, planning is simply addressing issues before they become problems. By the year 2010, all Wisconsin communities that wished to regulate the use of land (primarily zoning and land division regulation) must have adopted a comprehensive plan that met the requirements set out in the statutes. In Sheboygan County, all 28 communities met the deadline, and UW-Extension assisted 24 of these communities. Now the focous shifts to implementaion of the recommendations within these plans. UW-Extension has been helping local communities prioritize their plan recommendations and suggest tangible ways to work toward solutions. Naturally, the more participation there is by local officials, community leaders, and residents, the more accurate and credible the final vision will be. UW-Extension staff is available to help facilitate the visioning sessions and to provide overall guidance in working through the five steps listed above. Through the innovative use of public surveys and mapping overlays, composite maps are created to help indicate where a community’s residents would prefer to see various land uses develop in the future.